Although this high school library was located directly on top of a Hellmouth, it had some amazing special collections not to mention an incredibly knowledgeable Head Librarian, Rupert Giles who was also a member of the Watchers Council. This cozy library’s occult collection held titles such as Vampyr, The Writings of Dramius, Blood Rites and Sacrifices, and The Legends of Vishnu as well as a book cage which held an armory of weapons and occasionally restrained a transforming werewolf. This headquarters of Buffy’s “Scooby Gang” is one I’d definitely like to visit! Read more about this library here. 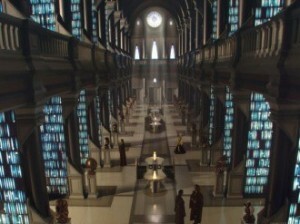 Containing the Jedi Archives, a vast collection of ancient knowledge and research dating back thousands of years, this library restricts access to members of the Jedi Order, with some materials only accessible to the Jedi High Council. The library consists of eight halls converging like the spokes of a wheel at a central rotunda and houses millions of holobooks and data sticks. Although I won’t be on Coruscant anytime soon to visit this library, I do have the option to visit the next best thing which is the Long Room at Trinity College Library (pictured below) which looks amazingly similar! Read more about the Jedi Library here. This iconic movie library is actually a beautiful space with a central circular reading room lit around the center by blueish Tron-like lights from under the balcony. The second floor has group work rooms and a media lab. This wasn’t an actual library, but a complete set created and filmed in the gymnasium of Maine North High School where John Hughes also filmed Ferris Bueller’s Day Off. Featured in The Mummy, this library in the Museum of Antiquities held scores of books about ancient Egyptians as well as artifacts. It’s dusty shelves and rare leather bound books gave the library a mystique that would appeal to many librarians, myself included. There is an actual Cairo Museum of Egyptian Antiquities with a library which specializes in ancient Egyptian civilization and is considered one of the most important libraries of Egyptology in the world. You can read more about it here. J.K. Rowling’s Harry Potter series features a beautiful library on the third floor of Hogwarts School of Witchcraft and Wizardry that is filled with spell books, magical histories, and potion recipes. Although all students may check out books from the Library, there is a special collection of valuable and particularly powerful books in the Restricted Section for which students need permission from a professor to access. 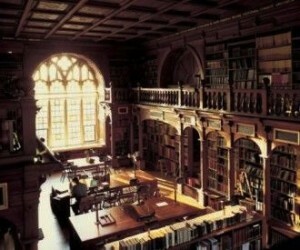 The Duke Humfrey’s Library, (pictured below) within the University of Oxford’s Bodleian Library was the location where the library scenes were filmed. 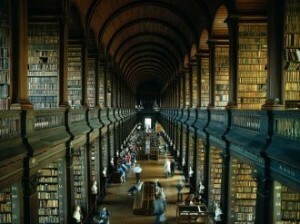 Read more about the Hogwarts Library here. This extraordinary library from The Librarian: Quest for the Spear holds all the greatest treasures of myth and history which are protected by the Head Librarian, Flynn Carsen. Some of the items Carsen is responsible for are Pandora’s Box, Tesla’s Death Ray, the Holy Grail, the transmuted corpse of King Midas, the Ark of the Covenant, the Golden Fleece, a live unicorn, the Goose That Laid the Golden Eggs, Excalibur, the original Mona Lisa (of which the Louvre version is said to be a copy). Read more here. The school for wizardry in Terry Pratchett’s Discworld series is known as the Unseen University located in the city of Ankh-Morpork. 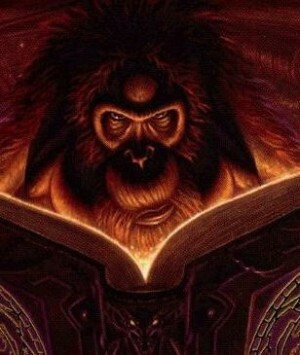 The library is a storehouse for magical tomes and references and is staffed by a librarian, who was turned into an orangutan due to a magical accident. 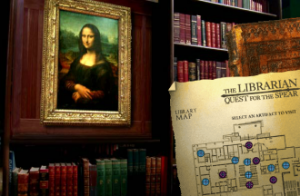 The library’s collection holds such titles as Featherwinkle’s Concise Compendium of Dragon’s Lairs, The Summoning of Dragons, and Octavo – the greatest of all Spell Books. Read more here. The Library at this H.P. Lovecraft fictional university in Arkham, Massachusetts (also fictitious) is said to hold a copy of The Necronomicon, a grimoire containing an account of the Old Ones, their history, and the means for summoning them. This powerful and dangerous book of arcane knowledge appears in many of Lovecraft’s works and is said to also be held in both The British Museum and Widener Library of Harvard University. Read more here. This feature film based on a popular comic book series features not one but two inspiring libraries; the beautiful Victorian private library of Dorian Gray and the secret wing of the British Museum where the League of Extraordinary Gentlemen meet. I would be happy to visit either library – although I have been to the British Museum, my tour did not include this secret wing! Read more here. This 51st century Library in the Doctor Who series encompasses an entire planet and as is known as the greatest library in the universe. It appears in a two-part story Silence In The Library and Forest Of The Dead in which the massive book repository which holds a copy of every book ever written is under attack by the Vashta Nerada, microscopic organisms that attack from the shadows. The library has a hard drive large enough to back up not only its print collection but the minds of several thousand people who were saved from certain death by a child who lives within the Library’s computer system. The Library scenes were filmed in The Old Swansea Central Library in Wales. Read more here.